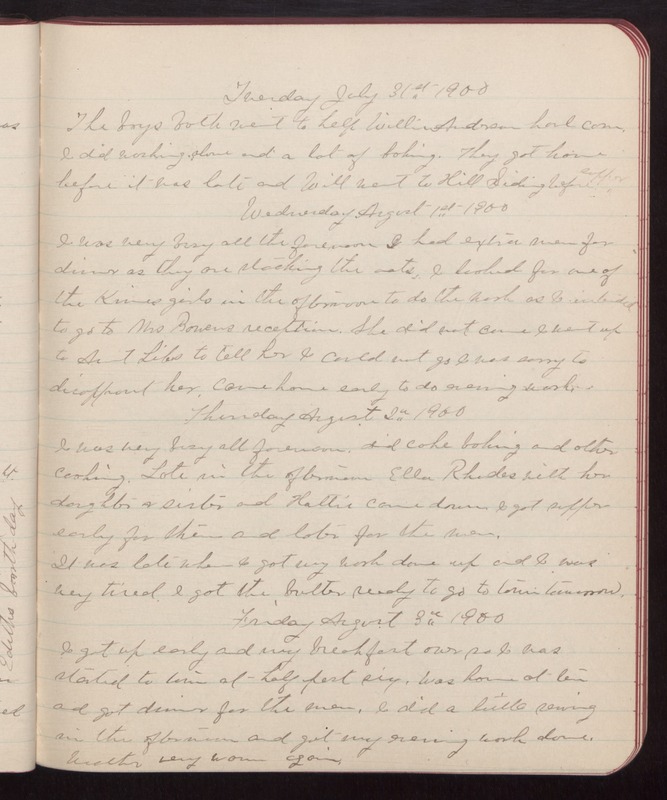 Tuesday July 31st 1900 The boys both went to help Willie Anderson haul corn. I did washing alone and a lot of baking. They got home before it was late and Will went to Hill Siding before supper. Wednesday August 1st 1900 I was very busy all the forenoon I had extra men for dinner as they are stacking the oats. I looked for one of the Kines girls in the afternoon to do the work as I intended to go to Mrs Bowens reception. She did not come I went up to Aunt Libs to tell her I could not go I was sorry to disappoint her. Came home early to do evening work. Thursday August 2nd 1900 I was very busy all forenoon. did cake baking and other cooking. Late in the afternoon Ellen Rhodes with her daughter & sister and Hattie came down. I got supper early for them and later for the men. It was late when I got my work done up and I was very tired. I got the butter ready to go to town tomorrow. Friday August 3rd 1900 I got up early and my breakfast over so I was started to town at half past six. Was home at ten and got dinner for the men. I did a little sewing in the afternoon and got my evening work done, Weather very warm again.